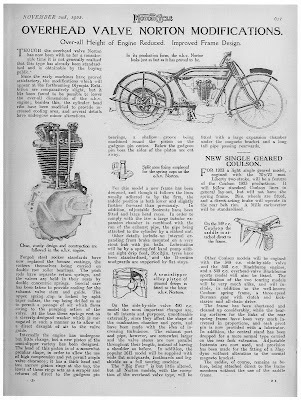 -SG- The Motor Cycle for November 2nd carried a press release (above) about changes to the OHV engine amongst other things. Reference is made to lowering the over-all height of the engine and in all probability this was achieved simply by fitting a 7" con rod rather than the 8" version used on the prototypes and the one OHV machine entered in the '22 TT. A shorter barrel would of course also have been needed.